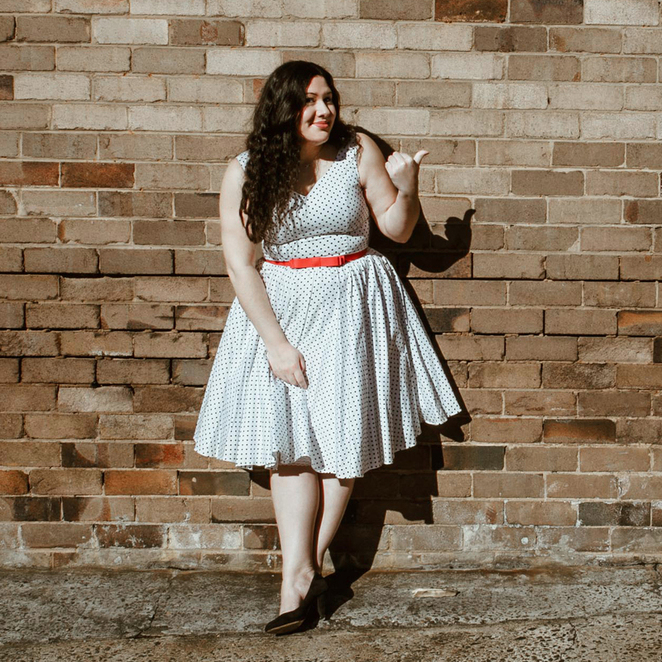 Elisa Cristallo's show A Sunday Story made its debut at the Adelaide Fringe festival last night and if there's one thing that I've taken away from the show is that Cristallo is a pure natural at storytelling! I didn't know what to expect when I first walked into the preview performance show, which took place in a moody and intimate setting at the Basement Bar in Hotel Richmond in the heart of Rundle Mall. Nonetheless, I left feeling pleasantly surprised and perhaps even a close friend of Cristallo! Dressed in a regal mulled wine maxi dress, the beautiful Cristallo walks on stage and instantly makes us feel at home. Proclaiming to be running an "Indie show", Cristallo assures her cosy audience members that the space is judgment-free and that anyone and everyone can feel comfortable and look after each other. The show has been set to have Cristallo present to us three overarching stories, complemented by a series of side-stories (if you will) that stem from real life events from Cristallo's life - right from childhood to the present day. I could personally feel a connection with Cristallo's material, which included a very serious (and REAL) case of arachnophobia, dealing with immigration, being a multicultural individual, and getting through the general ordeals of adulting! It was riveting to be taken on a journey through her mastered art of storytelling, where we basically met the entire Cristallo family - the mum, dad, brother, and even the Nonna made an appearance and boy oh boy! Are they some of the most whimsical and lovable characters ever! I feel like we, as the audience, might as well have grown up together with Cristallo, given how detailed yet succinct her experiences were described. I particularly enjoyed the Nonna piece by Cristallo, because it invoked so many emotions in a span of 10 minutes that by the end of that piece, all I wanted was to have a Nonna just like the one described so beautifully by Cristallo. This was a brilliant example of how quickly the mood and tone of the story went from being dramatic to hilarious to heart-wrenching to getting a sense of closure. Cristallo was also able to channel her Nonna in a way that gave her a stereotypical overview, but with a ton of unique individuality that made her one of the most likeable characters yet. Cristallo was eloquently able to weave words together to make an otherwise regular collection of stories a lot more animated, interesting, filled with pockets of moments of laughter, poignancy, and relatability. Cristallo is a versatile performer, who was able to transform herself into the many different characters that make an appearance throughout her show - from the facial expressions to the mannerisms to the stereotypical comical personas of a true blue Aussie bloke who just wants to find the perfect space for hosting a BBQ, an Italian Nonna who could have probably been considered the best cook in all of Italy, and a brother who was "too cool for you" (to name a few). Covering a range of ordinary topics around the environment, living on a farm, immigration, and house hunting with your significant other, Cristallo added an extraordinary twist to it, thanks to her ability to add a sprinkle of theatrical flair, a touch of charm, and a ton of likeability through her characters that are so relatable it hurts (it hurts good with all the laughter bursts that were experienced by the audience throughout the show)! Cristallo knew how to work the room effortlessly with her energetic yet composed attitude and engage the audience in something that is very close to heart. She has her signature style of entertaining audiences, which is not commonly seen or experienced at most comedy shows, making Cristallo a fantastic stand out! If anything is to go by her preview performance, we can say with confidence that there are great things destined for her in the performing arts and comedy industries. Why? The stories by Cristallo are going to be so relatable, it's going to freak you out!